The Bakpocket hammocks are distinguished by their unique double-layer design. Many models have interesting features such as pillow pockets and zipper enclosures. The Bakpocket Deluxe Adventurer Hammock is made from parachute nylon fabric in three panels, similar to many popular hammocks on the market. The Deluxe Adventurer, like many of the Bakpocket hammocks, has a double layer, a pad sleeve. It also comes with a pillow pocket that snaps to the hammock, right in the center. An inner pocket can be used to store small items when inside the hammock. I often get asked “what else can you add to a hammock” and I’m always pleased to see the innovation and efforts that designers make to enhance or extend a basic hammock. The Bakpocket hammock has some pretty slick ideas all rolled together into a single design. The pillowcase and clip are a nice addition. You can add a commercial pillow into the case, which then attaches to the hammock so it doesn’t slide away. You can also use the pillowcase as a storage sack for extra gear to convert it into a makeshift pillow. If you don’t want or need the pillow, it easily unsnaps. You can then use the pillowcase for other uses. The long, central zipper is another interesting innovation. 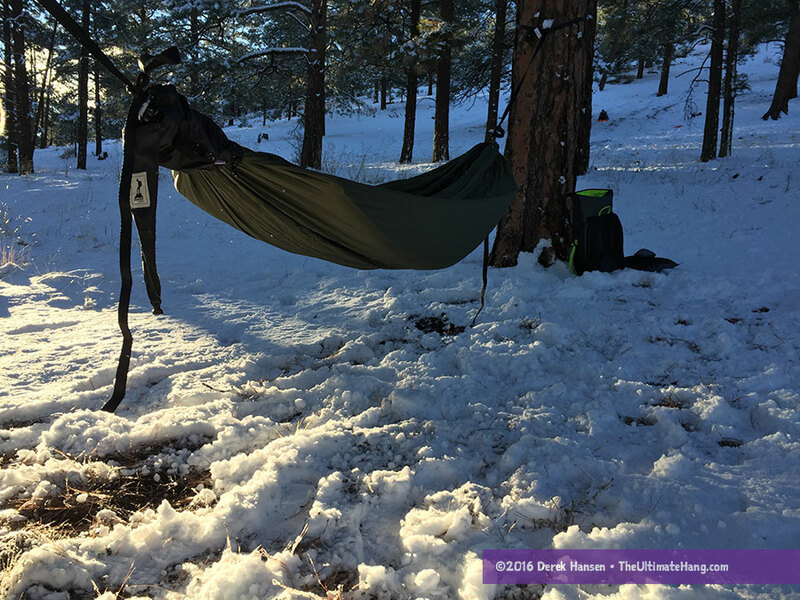 For wide hammocks, this can help make the hammock pull double duty as a wind shield for colder camps, thus creating a micro-climate inside the hammock. Others might see this as a bug-free option if they don’t want to pack extra external netting. One of my favorite features of this hammock is the stuff sack. This is by far the best Bishop-style stuff sack I’ve ver seen. The grommet is perfectly sized for the suspension and the compression fabric strap is a lot more useful than a simple webbing strap. A Bishop-style stuff sack is similar to a double-sided stuff sack and can remain on the hammock to make packing and unpacking easier and faster. I always keep the sack-side attached while I pack so that I can stuff the hammock without it ever touching the ground. The only thing that wasn’t a home-run for me was the pad sleeve. There are quite a few variations of the “double-sided” hammock now on the market that makes holding a sleeping bad a breeze. This pad sleeve on this hammock has the opening on the short end, which means that there is a lot of loose fabric on one end. This became problematic for me when I was laying in the hammock because fabric would bunch and hold underneath me making shifting around more of a chore. It’s something to adjust to if you choose this hammock. The thick, parachute fabric with this double layer is still a great defense for bugs trying to bite through the bottom. The hammock is also designed for a center lay, instead of the more traditional diagonal lay for Mayan-style hammocks. While this isn’t a problem for some folks, it isn’t my ideal way to get comfortable in a hammock. I love that this Bakpocket comes with high-quality carabiners that make clipping to suspension systems a breeze. The parachute nylon fabric is rugged and durable and is in line with the ENO-style hammocks on the market.